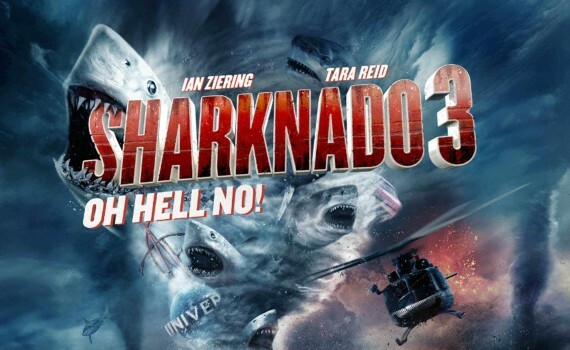 Movie Review – Sharknado 3: Oh Hell No! What is there left to say about a franchise like Sharknado? And this isn’t the end; if you watched the live showing of Sharknado 3: Oh Hell No! you could live-tweet at the end to help decide the outcome of Sharknado 4. So there are more! What is the world coming to? But putting the obvious atrocity of these movies aside, I’m not part of the contingent who think that people wasting their time on these films is a sign of the end times. I think they’re fun. Terrible of course, but fun none-the-less, and that can’t be all bad. I watched the first Sharknado and understood that I was watching perhaps the worst movie ever made. I watched Sharknado 2 and saw that the bar hadn’t been raised very high. And I sat through #3, enjoying what I could, cringing when I had to, and having a good time at the expense of others; what’s not to like? Fin Shepard is back again, this time in Washington D.C., where the storm of the century is about to hit, wiping out the nation’s capitol. But the safety of the world isn’t Fin’s only concern these days. After reuniting with April and asking her to marry him, the couple is expecting a child any day, and Fin won’t be stopped from getting to April in Orlando. Nope, won’t be stopped, not by frequent sharknados, washed out bridges, army bases, or old, hot friends who drive around in armored RVs with cannons on top. Sharks might be hitting the fan, but Fin must get back to his family, and he also must use a chainsaw on a dozen fish along the way. The sharknados begin to group on the east coast, forming a storm like no other, and only a group of ferocious heroes can save us from what would be a very windy, bloody, violent end. OMG it’s all too much. The film nearly explodes in the first five minutes, dropping audiences into the now-familiar storyline as if we’d never left. And from there, the plot doesn’t really change from the other two films; cut open sharks, run around, bomb things, and save the day. But the cast of hilarious characters is a little different this time, so let me run through a few cameos: Malcolm out of the Middle, the Hoff, President Mark Cuban, a horrible-looking Bo Derek, Ne-Yo, the walls of Jericho, Ann Coulter for some reason, Cindy Margolis, Anthony “The Weiner” Weiner, Jerry Springer, Ray J, Penn & Teller, a couple NASCAR drivers, Kendra & Holly, Harvey Levin, Chris Kirkpatrick, Chad Ochocinco, George R.R. Martin, Matt Lauer, Al Roker, Kathie Lee, Jared Fogle, and Michele Bachmann. Phew! Oh, and of course most of them die, none of them can act, and the entire thing is a big, stupid, awful, nonsensical mess that has no place being on our televisions. Will that stop us from watching #4 when it comes out next year? Oh hell no!